In 2016, Donald Trump went all in on the idea that his base of supporters wanted strict border security, particularly a wall on the southern border. Generally during presidential elections, most candidates include a wide variety of views in their platforms but heavily emphasize one or two issues. For President Donald Trump, that issue was building a wall on the border between the U.S. and Mexico. Trump has, so far, commissioned eight vendors to create prototypes of the wall. Four of these created prototypes are made with concrete-like substances, and the other four were created with materials other than concrete. But to build a wall, Trump will have to acquire the land. According to the news outlet Reason, Trump wants to use eminent domain to gather the land required for his promised wall. Eminent domain would mean the government could take private property if the owners receive fair compensation. Trump still has many hoops to jump through to get his long-promised wall built by 2020. Though Trump has not yet announced whether he will be running for re-election, his chances may be in jeopardy if he is unable to show tangible results from his campaign promise to build the wall. If someone promises something, and they don’t follow through, it becomes hard to believe they will deliver on any other promises. While it’s true that presidents are not always able to finish the work they promise due to circumstances beyond their control or other blockades to their plans, the main pillar of a platform seems like an important promise to keep. 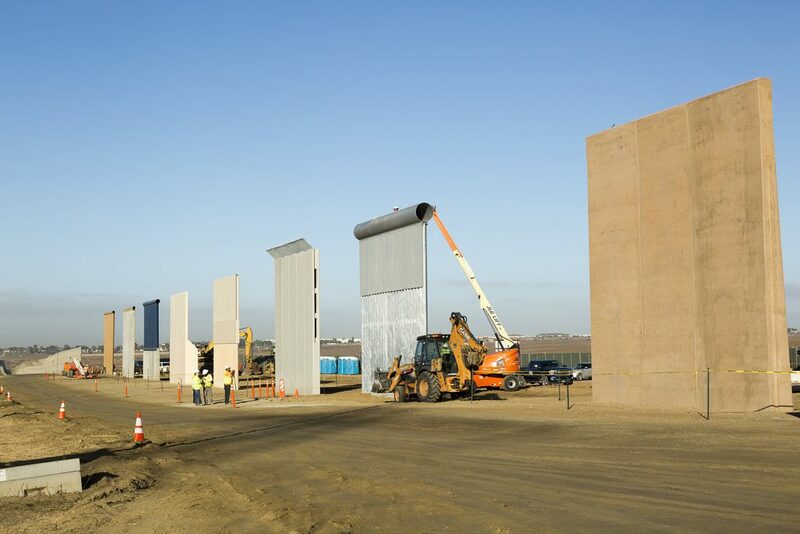 POSSIBLE WALL DESIGNS — In March 2018, President Trump went to California to view several possible prototypes for how the wall will look when it is constructed along the southern border. If Trump does not deliver on the wall, his approval ratings could sink past the point of no return because the wall was a major stance that he spoke about and his supporters believed in. In fact, his supporters, who generally dislike excessive government spending, have been supportive of paying to build the wall. A man by the name of Brian Kolfage even started a Go Fund Me page to build the border wall. According to both Morning Consult and FiveThirtyEight, Trump’s approval ratings have been on the decline. Would building the wall boost them? That remains to be seen. Building the wall would show that Trump is able to keep his biggest promise, but at what cost? He would have to take private lands and secure funds from somewhere. But for Trump, if he cannot show real progress on the wall, it could ruin his 2020 reelection campaign. Presidents have to show the people that they would be a reliable president if they wish to be elected and more so if they wish to be re-elected. The one thing that Trump cannot afford to break right now is trust.